Mix used to create Chili con Queso Dip. 1. Combine and blend 1 container with 10 lbs of sour cream. Add 1 quart (32 oz) Hellmann's® or Best Foods® Mayonnaise and 1 1/4 lb shredded chedder cheese. 2. Transfer to a baking dish and bake uncovered until internal temperature reaches 165 °F (74 °C) for 2 minutes. 3. Serve hot. 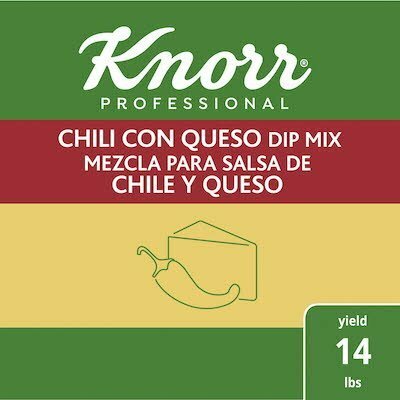 Great for creating a Chili con Queso Dip.